I love what you've done for our home. It's the best home repair project that I have ever done. The service is wonderful and I highly recommend Best to anyone. 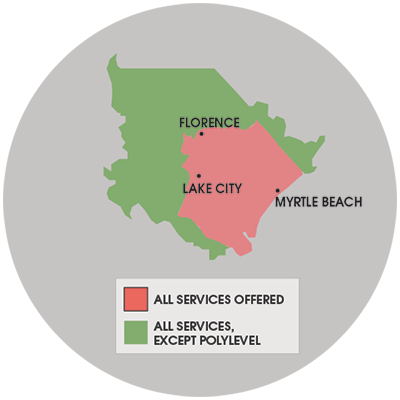 Best Home completed a Polylevel job for a customer in the the Queens Harbour Subdivision in Myrtle Beach, SC. The job was to even out the concrete around their outdoor pool. You can't even tell where one slab ends, and the other one begins. For a FREE no-obligation basement waterproofing, mold remediation, crawl space repair estimate in Myrtle Beach, SC, please fill out the form to the right and Best Home & Property Services will contact you shortly. Double wide with standing water under it. Also need yard to be graded away from the house. Underneath the doubkewide mobile home that is on a brick foundation, it is very saturated and even with all the vents pulled off it does not seem to be drying out. It has caused damage for sure. Interested in encapsulation of my crawl space and termite bond.
. I am inquiring to see if anything can be done to help with the water seeping in under the walls in our lower level of our home. Concrete driveway has settled and drains rain water into my garage. I also have some cracks in the driveway. I'm interesting in poly fill leveling. Crawl space has sagging insulation and might need a moisture barrier. Need to get a quote on repair. Can you come Wednesday morning at 10am? Wednesday June 13. Pool deck has several hollow spots under it and some settling. I have had service with Best for 10 years and every time the service is top quality. My wife has allergies that act up all the time, and it's no wonder why. After the guys were done installing the CleanSpace System by Best Home & Property Services, I was amazed by the difference. We not only adhere to the highest industry standards, we strive to be the industry leader in the home improvement related services we provide. We also use state-of-the-art products and technology which are designed to fix your home. We are the authorized Basement Systems dealer in Myrtle Beach, SC. Need to have a plastic vapor barrier installed in crawl space. I would like a free quote to install a vapor barrier. I have a 32x80 mobile home. the floors are bubbling up. I was told by my bug guy to get a moisture barrier under house. and new vents that open and close automatically. He was going to do it, but I have been waiting a month. I have most of the floor replaced and don't want the new sub floor to bubble up.